Have you ever dreamt of flying at night? Every pilot has at one point or another. From the ground, it seems like a fairly simple, peaceful endeavor to navigate through the stars without the glare of the sun getting in the way. Not to mention, it just seems like a calmer, more wondrous adventure for those pilots. However, any commercial pilot training program will teach you that flying at night is not actually as easy as it may seem. 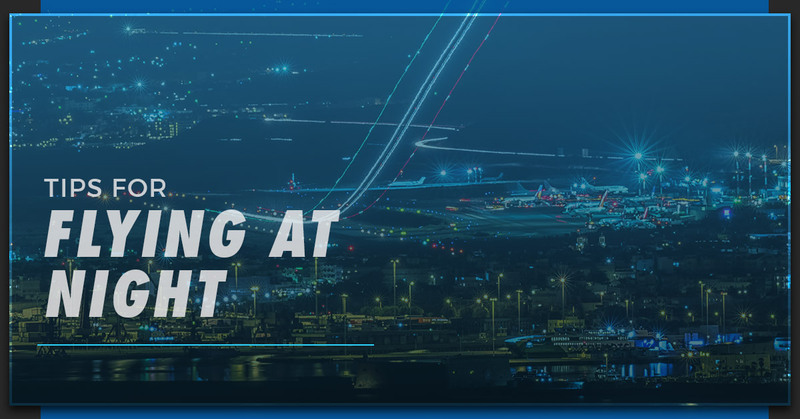 While the airspace is quieter, the air is more still, and the radio congestion is mitigated, there are still many challenges that face commercial pilots when navigating through the night’s sky. For obvious reasons, prior proper planning is imperative when flying in the dark — the absence of light can make it nerve-wracking for some pilots who don’t have the proper commercial pilot training. At Alliance Aviation, our commercial pilot academy can help you take off on the career of your dreams. Commercial pilot training is our specialty, and you’ll get all of the prerequisite lessons you need in order to earn your type rating and become an airline pilot. Part of your comprehensive commercial pilot training is learning how to fly at night; keep reading to learn a few basic tips for flying in the dark and enroll at Alliance Aviation’s pilot academy today. It can’t be overstated how important planning is when it comes to flight preparations at night. The night sky, while more peaceful, can be slightly more difficult to navigate through. Be sure you check (and double-check, when applicable) the aircraft’s pre-flight checklist prior to takeoff. That means examining the fuel quantity, inspecting the surface, and giving a thorough rundown shortly before the flight. Backup lights are imperative when it comes to flying at night. The cockpit needs to remain fairly dark when flying at night, simply because it is hard to see through the darkness otherwise. However, you will still need lights in order to see certain controls and navigational tools. You should make a thorough plan by having at least two flashlights (and ample batteries) on hand at all times — one on your person and one which never leaves the aircraft. Your flashlights should have both white and red light. That way, you have enough light to perform your pre-flight checklist with the white light, while the dimmer red light will provide enough illumination to support night vision without getting in the way with glare. Have you ever shut the lights off in your bedroom and were unable to see anything for a few seconds? That’s because your eyes take time to adjust to the darkness. That same concept applies to flying at night. At some point, you’ll be going from a fully illuminated cockpit to utter nighttime darkness. That means you need to give your eyes ample time, typically about five to 10 minutes, in order to properly adjust. Another thing to keep in mind is that once your eyes are adjusted to the darkness, they become exponentially more sensitive to light. Think of it like driving on a dark highway at night — your field of vision may be completely fine as you drive along, but the moment another car passes by and your eyes are exposed to the headlights, it becomes slightly more difficult to see. If you are flying at night, you should always keep light from going directly into your eyes, whether it’s your flashlight or another aircraft passing by. While it may not always be possible to take on extra fuel for a flight, it might be a useful when it is possible for night time flights. This applies mostly to private pilots who may not have access to the FBO, or flight base operator, because it is after hours. Much like when driving a car at night, it’s important that you make sure all of your aircraft’s lights are up to snuff and in working order before you take off on a night time endeavor. Be sure you check and double-check your navigation lights, landing lights, taxi lights, interior panel lights, and any other lights you may have on your aircraft. In order to earn an ATP-CTP certification, which means you are capable of flying a cargo or passenger plane, the FAA requires that pilots complete at least three takeoffs and full-stop landings at night within the last 90 days. As you can see, that’s why it’s so important to understand how to fly at night. When searching for the best tips and the top commercial pilot training in Miami, Alliance Aviation is the place you can trust. Your future is here — take off today and enroll at Alliance Pilot Academy.